At just 19, Jeremy Slate tore three major ligaments in his knee and had what was supposed to be an easy surgery. As it turned out, after being completely out for three days, he received last rites from a priest. This should have been a life-changing event for him, but it wasn’t. He went on to receive his masters degree in ancient history from Seton Hall University, studied literature at Oxford University and graduated into one of the worst job markets in history. Jeremy’s intention was to get his PhD, then teach college, but instead he ended up continuing as the weekend manager at the same gym he’d worked at for 8 years. Jeremy was a high school teacher, personal trainer and finally found his place in marketing, starting a personal training company, MLM business and selling life insurance at the same time, which was the start of his entrepreneurial journey – and burnout. In 2015, Jeremy started the Create Your Own Life Podcast and runs Command Your Brand and Slate Media Productions. He enjoys helping people reach the level that they believe they can because he believes they can get there. Through his podcast and blog he seeks to help people build the business and the life they dream of. Jeremy has interviewed over 250 entrepreneurs he greatly admires, including Grant Cardone, Tucker Max and Robert Greene. He wants to give actionable things that can be done, not just more fluff. Create Your Own Life gives the steps and skills that successful entrepreneurs, business people and artists applied to create life on their terms. 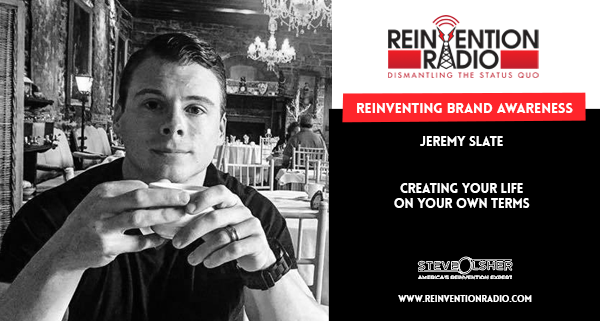 TUNE IN to hear Jeremy discuss with Steve, Mary and Richard reinventing brand awareness and creating your life on your own terms. Reinventing Youth Employment – In this episode, Julia Neiman discuss with Steve, Mary and Richard how she teaches teens, young adults and families how to create a successful financial future doing what they love.